Excellent tip: The best dishes typically make it to the menu, while the "specials" are often untested new dishes. Stick to the menu if you can. I've ordered a special tonight, because there's nothing new or appropriate on the menu. This big hunk of fish doesn't taste too different to other crispy-skinned hunks of fish I've eaten. The skin is just slightly on the over-fried side, but it's fine. 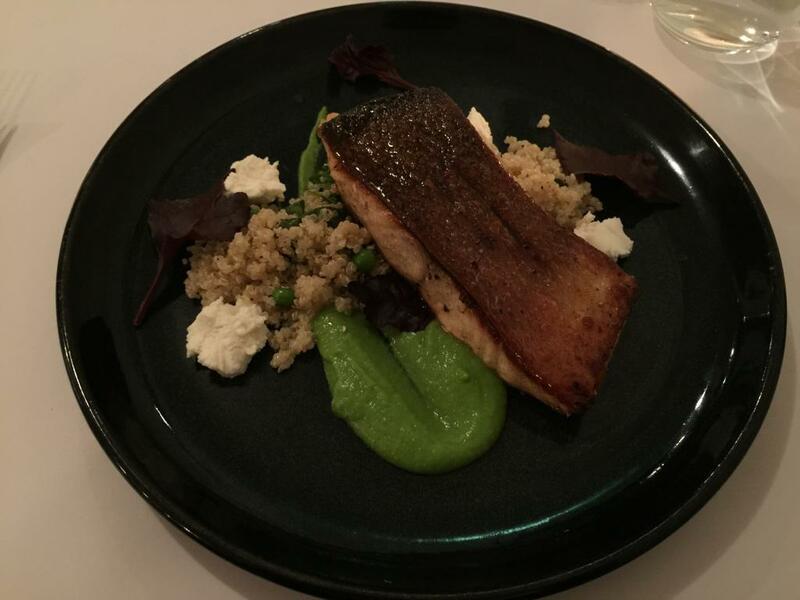 The pea purée is an amusing sauce for the fish, but there isn't much of it. The quinoa and fetta salad is pleasant, but it's very salady and lunchy, and doesn't really go with the hot fish. There are a few mint leaves in the salad, and I know to carefully tear them up, and distribute them evenly between mouthfuls. Mint is super-strong, and will overpower other flavours if not eaten carefully. This fish dish was a very acceptable lunch. Chocolate brownie, hazelnut mousse, blackcurrant. This smells very strange. It smells like smoked fish. My nose has a bad feeling about this. 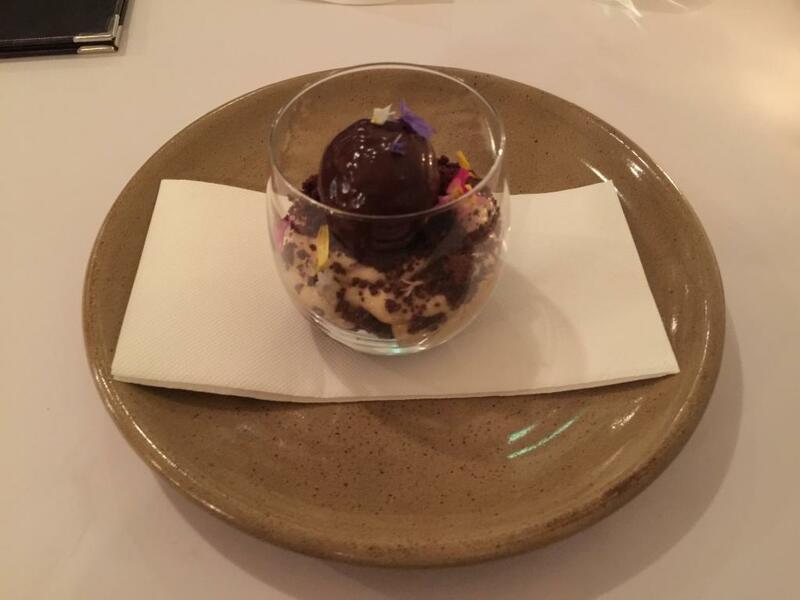 The chocolate brownie and mousse are independently tasty and rich, but the cream between them contains long violet flowers that add an inappropriate stringy texture. In a dessert this sweet, the smoked taste can be pulled off. It's actually not too different from the cocoa taste. I don't think it adds anything to the dessert, but it doesn't hurt it either. However, at the very bottom of the cup, the smokiness starts to taste like eating a log from the fire. Update: The taste at the bottom is actually a little bit of the smoked mousse, but mostly the bitter Belgian "Calebeaut" chocolate.